In 1859, to satisfy his weekend hunting obsession, an Australian settler imported twenty-four rabbits from England and released them on his property. The hybrid offspring resulting from inbreeding were hardy and vigorous, and the climatic conditions and habitat were so agreeable for breeding that Australia’s rabbit population reached ten billion by the 1920s—thus validating sayings about their reproductive prowess. This population explosion has had a devastating impact on the local ecology; the rabbits eat native plants that normally feed livestock and cause erosion of topsoil. The Aussies have resorted to hunting, trapping, and poisoning to eliminate them, and in 1907 constructed a 2,000 mile (3,200 kilometer) rabbit-proof fence in Western Australia to contain them, without success. Biological approaches have included the introduction of bacteria and the far more successful myxoma virus, which eliminated their population by more than 95 percent in some areas, before the emergence of resistance. The current rabbit population is approximately 200 million. UNWELCOME GUESTS. Rabbits are but one example of an invasive species—plants, animals, or microbes—that are introduced into a new ecosystem where they are not native, and they outcompete the native species causing their decline or elimination. Invasive species, which may be introduced accidentally or intentionally, are very competitive, highly adaptive to their new environs, and extremely successful at reproducing. If the new environment lacks predators, their spread will go unchecked. The cannibal snail (Euglandina rosea, rosy wolfsnail), a native of the southeastern United States, was intentionally introduced to Hawaii in 1955 to eliminate another invasive species, the giant African land snail. This effort was not successful but the native O’ahu tree snail proved to be collateral damage and was almost hunted to extinction. The predatory cannibal snail is now considered the greatest threat to indigenous snails in Hawaii. Zebra mussels originated in the Balkans and Poland, and first appeared in North America in Lake St. Clair in 1988, after their accidental discharge in Canadian waters. These highly effective filter feeders deplete algae and small animals that are the food of native species, interfere with the feeding of native mollusks, and tenaciously attach to hard surfaces, including water intake pipes. SEE ALSO: Ecological Interactions (1859). 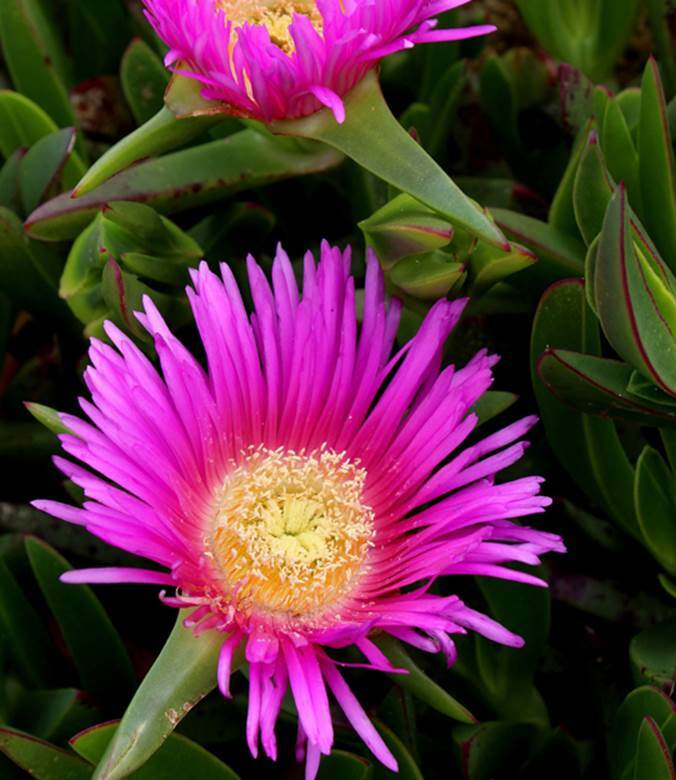 Carpobrotus edulis—also called the highway ice plant, pigface, and sour fig—is native to the Cape region of South Africa. However, the succulent plant has become an invasive species in the Mediterranean and parts of California and Australia.